The promised crispy skin exceeded all expectations. The five spice + ginger + garlic butter under the skin was genius. Brining for at least a couple of hours also highly recommended. Splattering fat made a mess of the oven. A cooling rack set over a 13×9 pan works just fine in lieu of a proper broiler pan and top. Cooking the peas under the chicken in a second oven visit was a little bit of a hassle but very smart and delicious. Cheap. Like, stupid cheap even though we only buy natural/organic chicken. Chicken thighs are awesome. I need new knives that are actually sharp enough to score skin. That part was unnecessarily difficult. 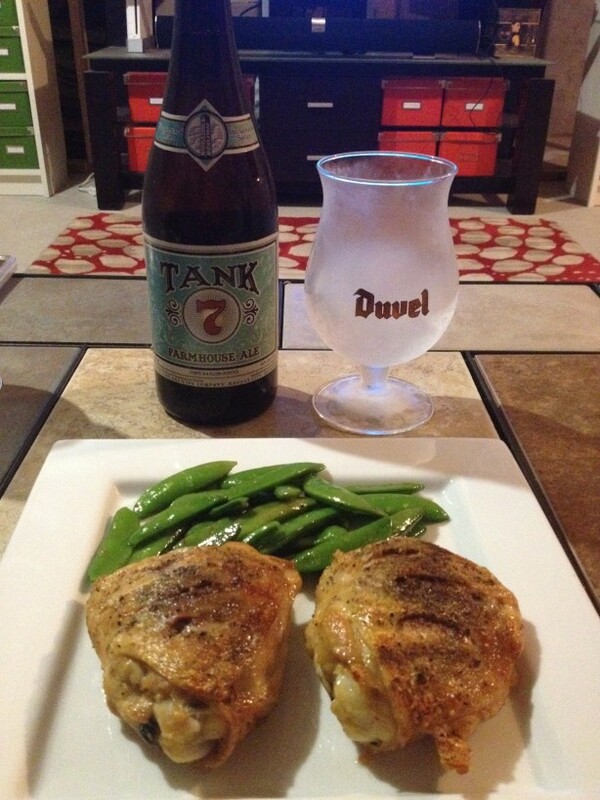 Bonus: a REALLY good 8% ABV saison (farmhouse ale) out of Kansas City – Boulevard Tank 7. Complemented the food perfectly, as would any citrusy-peppery beer; Sam Adams Summer Ale comes to mind as something more widely available, although it’s the wrong time of year for it. Those look fantastic. Happy to have stumbled upon your cool and diverse blog as a fellow classical musician foodie!